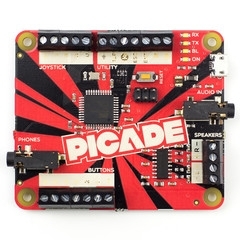 This is an Arduino-compatible board with integrated 3W stereo amplifier designed for use in arcade projects (like our Picade). It behaves like a keyboard when plugged in via USB and has a default key-mapping (though you can reprogram it using the Arduino IDE). Connections are made using screw terminals for a solid, permanent installation. 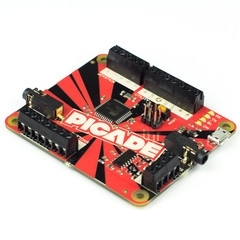 It uses the same micro-controller as the Arduino Leonardo (the ATmega32U4) and is pre-installed with the Arduino bootloader and our software.